So this time I made it a bit more like they’re used to. 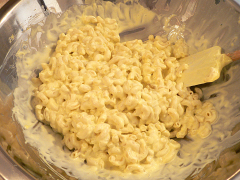 About twice the mayo as last time, though still not as runny as the pre-made stuff. I’ve got to admit, this was pretty good, too. 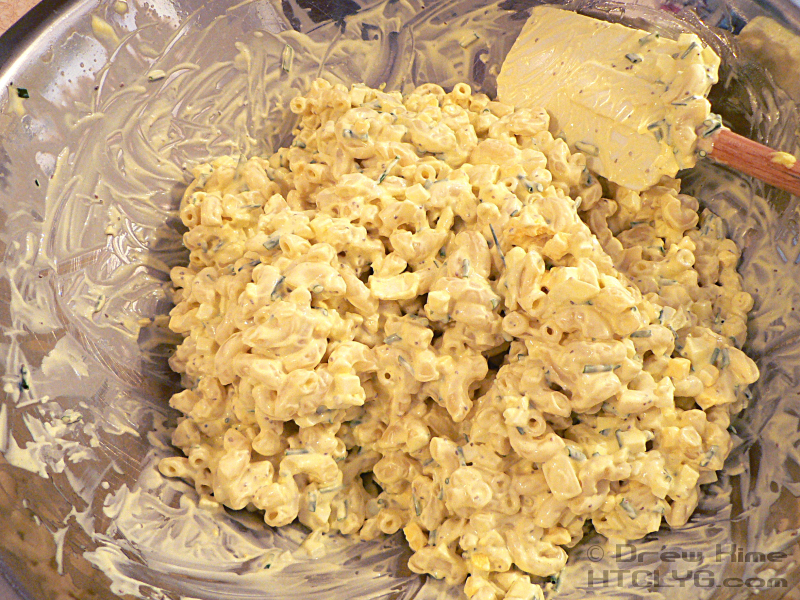 Of course that might be because I’ve finally got the hang of how to make mayonnaise from scratch. Set a large pot of water on high heat for the macaroni, and a smaller pot with the three eggs to hard-boil. 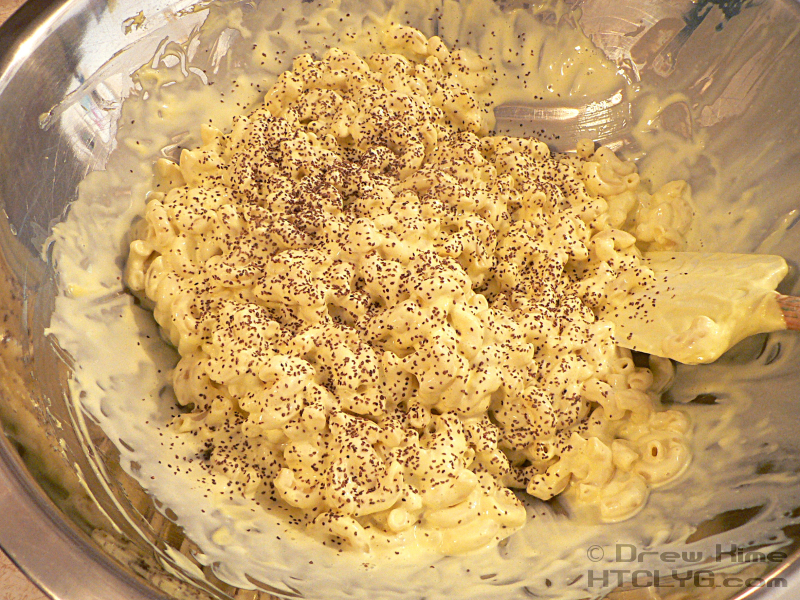 The eggs will take longer than the macaroni, so you might want to do them in advance. 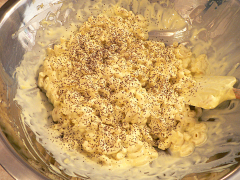 In fact, do a whole pot of them and keep the hard-boiled eggs in the fridge. That way you can decide you want deviled eggs for dinner and not have a half-hour wait ahead of you. While you wait for the water to boil, dice the onion and chives. Yes, the onions were the pieces that were too small for the beer-batter onion rings. Use your leftovers. 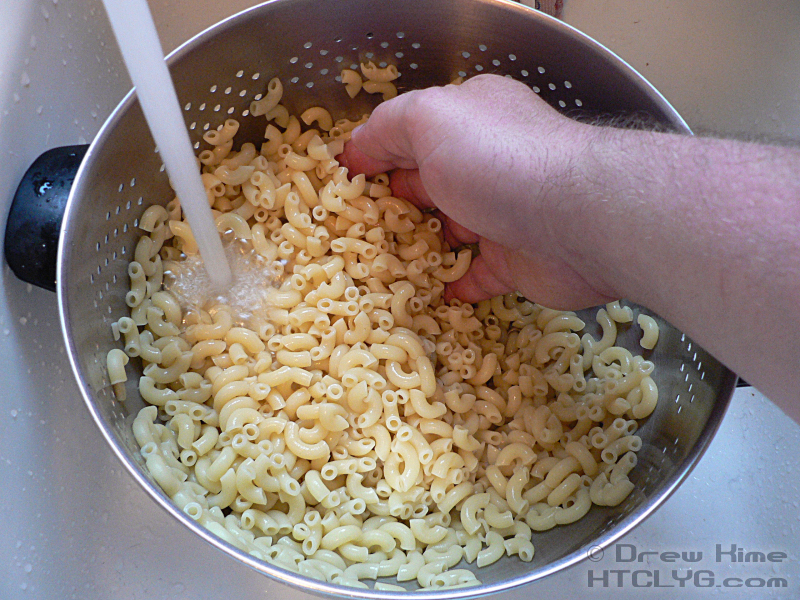 When the pasta is done, strain it in a colander and rinse with cold water until it is completely cooled off. Get in there and stir it up with your hand. That’s the easiest way to know when it’s all cooled off. 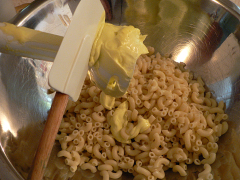 Make the mayonnaise and add it to the macaroni. You don’t have to make your own, but please at least use real mayonnaise. 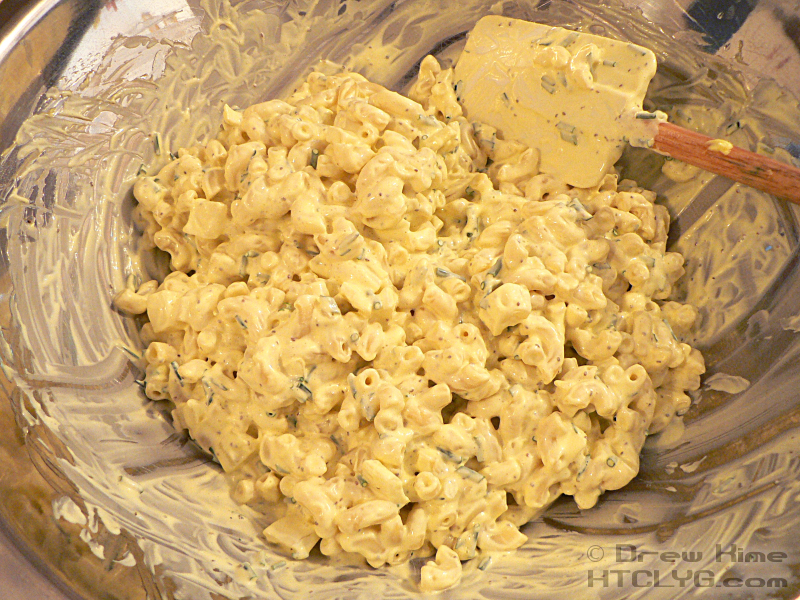 “Bread spread” or “salad dressing” or “lite low-fat almost-tastes-like-real-food white goo” don’t count. I’ve heard of people adding sour cream or yogurt to the mix. As long as it’s real sour cream and real yogurt, that could be good, too. 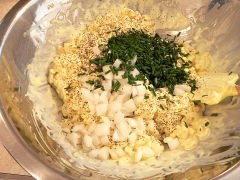 Add the celery seed, onion and chives. 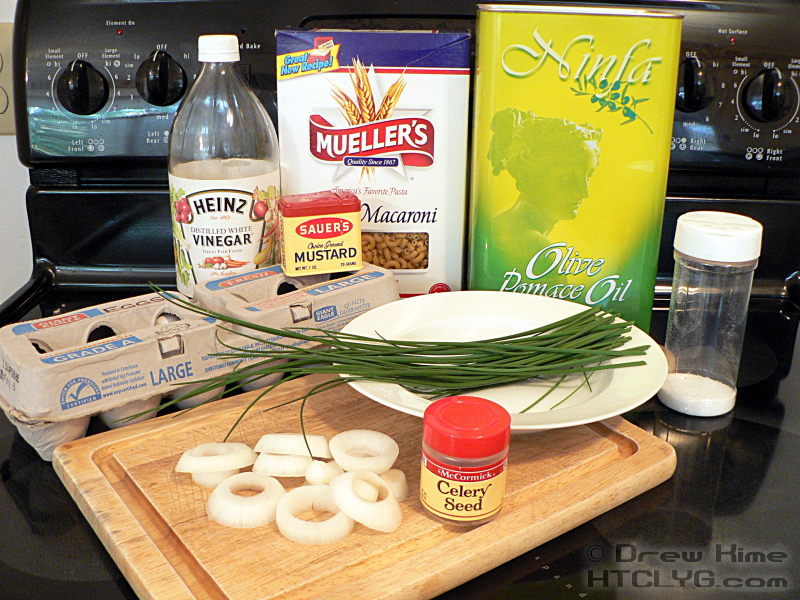 Dirty little secret: I don’t measure the celery seed. 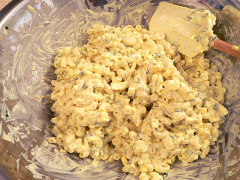 I just add enough to cover the top layer pretty well, like you see in the picture above. 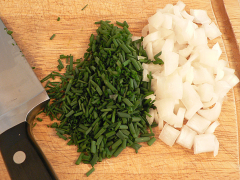 And here’s my rule of thumb for celery, onion and chives. Celery adds crunch and color. Onion adds flavor and crunch. Chives add color and flavor. You need all three elements, so at least two of these three ingredients. Uh oh, my geek side is insisting on a chart. You might wonder why I keep adding a few things and mixing instead of adding it all at once. If you let the pasta drain well, it can be pretty sticky by the time you start adding ingredients. 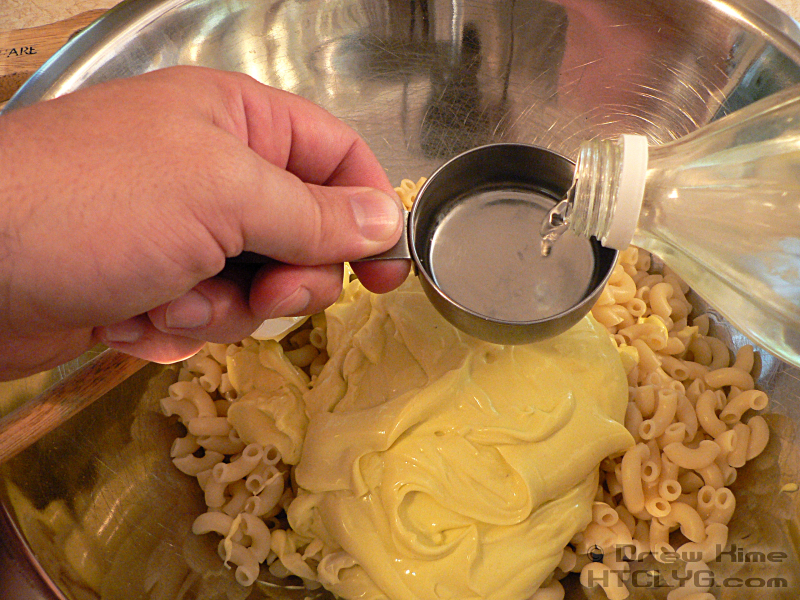 So I like to get the mayo and vinegar in first to lube it up before adding the dry ingredients. But I hold off on the egg until the very end so I don’t crush the little pieces of hard-boiled yolk. 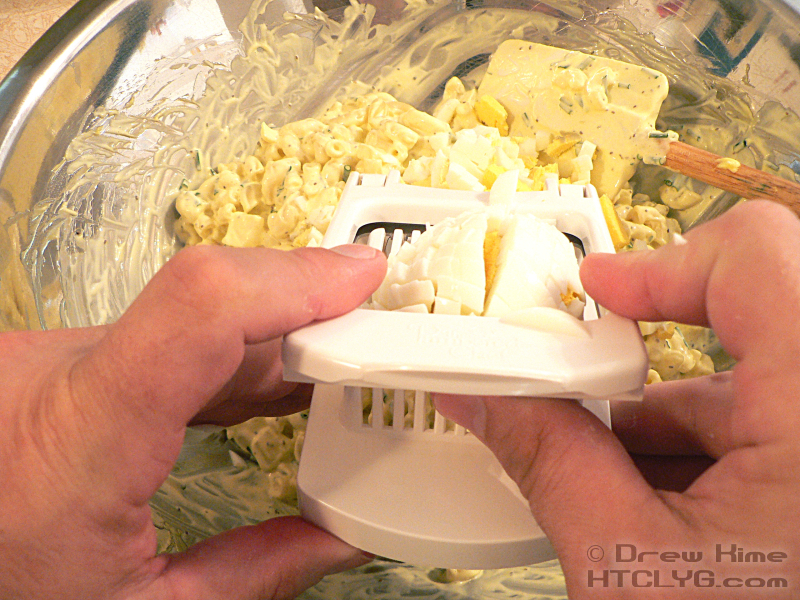 So that’s next, dice the egg into the pasta and mix gently one last time. 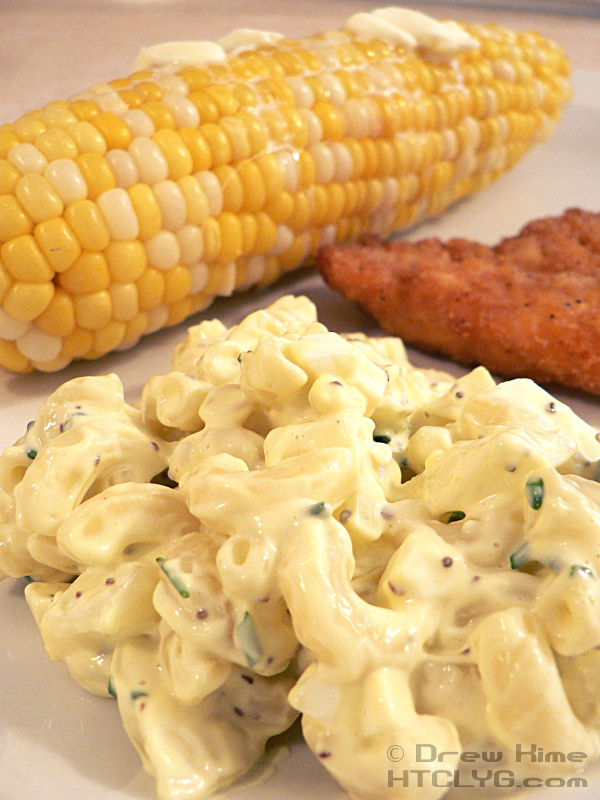 Serve with corn on the cob slathered with cultured butter and kosher salt, and baked chicken. To get a free copy of all the recipes as soon as they’re posted, subscribe using the form to the right. Cook pasta until al dente. (Firm, not mushy.) 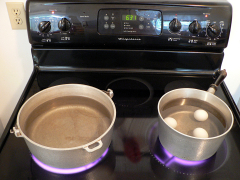 While it is cooking, combine all other ingredients except the hard-boiled eggs. 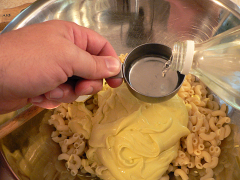 If making mayonnaise from scratch: Blend yolks and vinegar until an emulsion forms. Drizzle the oil in slowly while blending. Add mustard powder and salt after half the oil is in. Drain the finished macaroni and mix into the dressing. Dice the hard-boiled eggs and stir in gently, so you don't crush them.